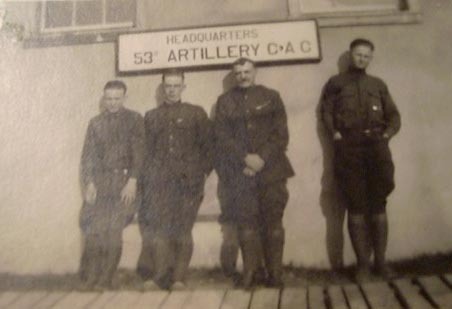 The 53rd Artillery was originally organized as the 8th Provisional Regiment in July of 1917 at Ft. Adams, Rhode Island. In August of 1917 the Regiment was moved to Port of Embarkation Hoboken, New Jersey as per sailing orders. Orders came and on 25 August 1917 the 8th Provisional Regiment sailed aboard the transport Pannonia with 79 Officers and 1,696 Enlisted men. While in France the 8th Provisional Regiment was re-organized as the 53rd Artillery Regiment C.A.C. in February of 1918. The Regiment was stationed at the O&T Center No. 6 (Operation and Training) at Mailly and Haussimont, France. The Regiment was part of the 30th Separate Artillery Brigade. Its sister regiments were the 42nd, 43rd, and 52nd Regiments. The 53rd served as Army Artillery for the American First and Second Armies while at the Front. During August 30, 1918 -September 16, 1918 the 53rd was with the First Army firing in support of the St.-Mihiel Operations. And again with the First Army during the Meuse-Argonne Operations 26th September-11th November, 1918. Elements of the 53rd, 2 Batteries of 19cm guns, 2 Batteries of 340mm guns and 1 Battery of 400mm guns, were with the American Second Army during Post-Armistice activities from November 12, 1918 - April 15, 1919. Battery H was awarded the Criox de Guerre with 1 Palm by the French Government. The Regiment sailed for home on February 25, 1919 aboard the transport USS Nansemond. After landing at Newport News, VA the Regiment first went to Camp Stuart, VA for demobilization of the drafted men and then during March the Regulars went on to Camp Eustis, VA., where they were retained in the army on active duty at Camp Eustis as part of the 30th Artillery Brigade. Battery B was the 11th Company at Ft. Monroe, VA. Battery C was the 12th Company at Ft. Monroe, VA. Battery D was the 10th Company at Ft. Monroe, VA. Battery G was the 3rd Company stationed at Rockaway Beach, NY in June of 1917 and then moved to Ft. Adams in July of 1917. Battery I may have been the 3rd Company Ft. Caswell, NC. Battery M was the 4th(II) Company at Ft. Screven, GA. The weapons used were all Railroad Artillery of three different calibers. They were the 19cm, 340mm and 400mm pieces. Battery A used the 400mm guns while Batteries B and D used the 340mm guns. As I find information on men who were in the 53d Artillery I will list them on the Regimental Muster page. This page is devoted to telling the stories and history of the men who served in the 53rd Artillery during WWI. If you have family members or know of someone who served in the 53rd please e-mail me and I will add them to this page. The initiative plans of organizing the 8th Provisional Regiment, C.A.C., began on April 10th, 1917 when the French Government, through the American Military Attaché at Paris, requested the United States to send to France a number of seacoast guns and mortars for use on railway mounts on the Western Front. The Chief of Coast Artillery, concurring in a recommendation of the Chief of Ordnance, and indicating that it would be practicable to set aside approximately forty 10 inch guns and stating that it would be practicable to furnish the manning personnel to serve these guns from the Coast Artillery Corps. The proposition of the Chief of Coast Artillery was approved by the Secretary of War on May 17, 1917, (W.C.D.9141, -3). In this connection it was desired to organize a brigade of Coast Artillery Corps, suitable in the opinion of the Chief of Coast Artillery for the efficient service of these guns. It was planned that this brigade be organized into three regiments, namely 6th, 7th, and 8th Provisional Regiments, (C.A.C. ), and each regiment to consist of twelve batteries, organized into three battalions. It was first planned for the 8th Regiment to mobilize at Fort Terry, N.Y. The commissioned and enlisted personnel of this regiment was made up as indicated in accompanying table marked "B". (Researcher's note: Table "B" was not with this file.) The selection of Officers was carefully made, having in mind the past service of the Officers and their ability for this special work. The battery commanders in most cases selected and organized the enlisted personnel of their batteries at various Coast Defenses from which they were ordered. The 8th Provisional Regiment (CAC) was organized at Fort Adams, R.I., the first organization to arrive was Battery "A" (3rd Co., Fort Howard, Md. ), July 21, 1917. Other organizations arrived as follows: Battery "C" (12th Co. Fort Monroe, Va.), July 22, 1917, Battery "B" (11th Co., Fort Monroe, Va.), July 22, 1917, Battery "D" (10th Co., Fort Monroe, Va.) July 22, 1917, Battery "E" (3rd Co. Fort Wadsworth, N.Y.) July 22, 1917, Battery "F" (3rd Co. Fort Hamilton, N.Y.) July 22, 1917, Battery "G", (3rd Co., Rockaway Beach, N.Y.), July 22, 1917, Battery "I" (1st Co., Fort Hunt, Va.) July 23, 1917, Battery "K" (1st Co. Fort Washington, Md) July 23, 1917, Battery "L" (2nd Co. Fort Caswell, N.C.) July 23, 1917, Battery "M" (2nd Co., Fort Screvens, Ga.) July 28, 1917, Battery "H" (2nd Co., Fort Moultrie, S.C.) July 28 1917. Headquarters and Supply Co. organized at Fort Monroe, Va., July 13, 1917. Left Fort Monroe, Va., July 20, 1917 and arrived at Fort Adams, R.I., July 22, 1917. Camp of the regiment was established between the rear of the officers quarters and the beach. From date of arrival of the organization up to July 31, 1917 work of establishing camp was carried on. Intensive drill from 8 A.M. to 11 A.M. and from 1 P.M. to 5 P.M. in various Infantry, Artillery, sanitary and other features. Lectures on Artillery Fire Control were given the officers from 4 P.M. to 7:30 P.M.
A portion of the 1st Battalion (230) commanded by Captain John T. Rowe, CAC, marched to the improvised target range, July 30, for small arms practice, returning July 31, a distance of 15 miles. The Regiment was reviewed as follows: July 27 by the Brigade Commander, Brigadier General George T. Bartlett at Mr. T. Suffren Taylor's Polo Field; July 29th by the Chief of Coast Artillery, Major General E. M. Weaver. At the close of the month, the entire regiment was in camp at Fort Adams, R.I.
During the first weeks of August the drill and instructions were carried on with lectures in Artillery, Gunnery, etc, for the officers, daily from 8 to 9 P.M. by the Brigade Gunnery Officer, Captain A. L. Rhodes, CAC, and some additional reviews at the Polo Field, where on the 5th, the ladies of Newport R.I. presented the command with the regimental colors, silk, and national, 36 Bugles and 10 drums. The people of Newport, R.I. extended to the command, the kindest of welcome, the best evidence of this being the numerous donations given for the comfort of the command, among which may be mentioned about 1675 sweaters and comfort kits, about 100 wrist watches were presented to noncommissioned officers of long and distinguished service and a carting phonograph for use in assisting the command to learn the French Language. There were records in French and a book giving the translation accompanying the machine and many other favors, too numerous to mention. The 1st Battalion finished its Small Arms practice August 2nd, the 2nd Battalion had it small Arms practice August 3rd and 4th and the 3rd Battalion August 6th to 8th. The Regiment proceeded August 24th to New York City enroute abroad as follows: (a) The 1st and 2nd Battalions boarding the Fall River Steamer Plymouth at 10:30 P.M. (b) The 3rd Battalion and Hdqtrs. and Supply Co., boarding the Fall River Steamer Commonwealth at 11:00 P.M. The regiment arrived at New York the following day about 9:00 A.M. and proceeded aboard the Cunard Steamer "Pannonia", which sailed at 3:20 P.M. August 25, 1917. Total strength of Regiment: Officers - 49, Enlisted Men - 1643, Casual Officers - 19, Casual Enlisted Men - 14, Attached, Officers - 11, Attached, Enlisted Men - 38, Grand Total - 1774. The Pannonia arrived in Bedford Bay, Halifax, N. S. at 8 A.M. August 28th and was at this anchorage at midnight August 31, 1917. During this time various drills were held and the command went ashore for exercise (road Work) as follows: 1st Battalion, August 31, 1917; 2nd Battalion, September 1, 1917; 3rd Battalion, September 3, 1917. Boat Drills were held daily. Visits of courtesy were not made on arrival in view of the attitude of Port authorities and the admiralty officials. The Regimental Commander, Lieutenant Colonel Fergusson, was commissioned Colonel, Field Artillery, National Army, August 17th and relieved from duty with regiment per Telegrams, War Department, August 15 and 21st, 1917. This commission was declined and he rejoined the regiment August 25th, at New York City prior to its embarkation. The Regiment left Halifax (Bedford Bay) at 5:30 P.M., September 5, 1917 and dropped pilot at 6:10 P.M. The convoy leaving Halifax consisted of 13 ships. On Monday, September 10th that ship carrying the regiment, entered the extended danger zone and the same day, toward evening passed a friendly tramp steamer. During the voyage, the regiment was instructed by the ship's officers preparatory to leaving the ship in case of emergency. Lifeboat crews were assigned from the Batteries but no occasion arose to use them, for which all were greatly pleased. Otherwise the trip was uneventful. On Thursday, September 13, 1917 a convoy of 12 allied cruisers and destroyers met the ships. On Friday night, the 14th of September the lights along the southwestern coast of England were sighted and then Saturday Morning the coast of Wales. The voyage ended by sailing into the Mersey River at 3:15 P.M. The allied cruisers and destroyers having safely conducted the convoy into Liverpool Harbor, through the St. George's Channel. The Regiment left Liverpool for Southampton, via the London and Southwestern Railway, as follows, Sept. 16, 1917, 1st Battalion at 10:45 A.M., 3rd Battalion at 12:30 P.M. and 2nd Battalion at 11:55 A.M. and arrived at Southampton, England as follows: 1st Battalion, 7:30 P.M., 2nd Battalion at 8:30 P.M. and 3rd Battalion at 9:30 P.M. same date. The Regiment went into camp at Southampton Rest Camp on the night of Sept. 16, 1917. The Regiment remained in cantonments until Sept. 24th, leaving at noon and marched to wharf at Southampton where it boarded the S.S. "LaMargarite" about 6:15 P.M. for Le Harve, France, where it arrived at 6:15 A.M. Sept. 25, 1917. Regiment disembarked at 9:15 A.M. and marched to English Rest Camp No. 2, a distance of 2 1/2 miles. It marched to station (Gare) Maratime, 9:00 P.M. that date and entrained for its station (Gare) Mailly Le Camp, arriving at 9:00 P.M. the following date, Sept. 26, 1917. From date of arrival at Mailly to September 30, 1917, the work of establishing camp was carried on. Batteries "A" and "C" left Camp Mailly, France for Haussimont, Marne, France on October 6, 1917 by marching. The 2nd Battalion (Batteries, E, F, G, H,) left Camp Mailly for Haussimont October 31, also Hdqtrs 2nd. Bn. Per verbal Instructions, Brigade Commander. From October 1st to 31st intensive drilling was done from 8 A.M. to 11:30 A.M. and from 1 P.M. to 4:30 P.M. in various Infantry, Artillery and Sanitary features. Headquarters of Regiment and 1st Bn (less Btrys A & C) were moved from Mailly to Haussimont on November 5th. From November 1st to 30th intensive drilling was done on Infantry, Artillery and Sanitary features. The Batteries stationed at Haussimont during the month were engaged in constructing work. From December 1str to 31st the Regiment was engaged in infantry, Artillery also Sanitation. Batteries stationed at Haussimont, throughout the month were engaged in railroad and camp construction work. 1 officer and 41 men of Battery "D" left for target practice at Vatry with 340-mm rifle, on December 29th, returning same date. The regiment had heavy Artillery Target practice during the month. The Headquarters of the Regiment, 1st and 2nd Battalions and Medical Detachment were stationed at Haussimont, Marne, France. Battery M left Mailly, Aube, France on Jan 5, 1918 and marched to the station of the Regiment at Haussimont, Marne, France. Batteries "I", "K", "L" and the Hdqtrs and Supply Co. remained at Mailly. The regiment had heavy artillery target practice during the month, in addition to the construction work and intensive training it was undergoing for active service. Headquarters of regiment, 1st, 2nd, and 3rd Battalions and Medical Detachment stationed at Haussimont, Marne, France. Battery "K" marched from Camp Mailly, Aube, France to Haussimont on Feb. 12th and Battery "L" on Feb. 16, 1918. Both Batteries stationed at Haussimont from date of arrival. The regiment was engaged in railroad and camp construction work and intensive training for service at the front, throughout the month. The official designation of the regiment was changed from 8th Provisional Regiment (CAC) to 53rd Artillery (CAC) per General Order 21, Hdqtrs, American Expeditionary Forces, February 5, 1918. A group consisting of Batteries "I" and "H" and two 32 cm, Guns, commanded by Major (then Captain) Albert Gilmore, C.A.C., left Haussimont on the night of Feb. 10, 1918 for position on the front, and arrived at Garage, "Kilometer 209, Somme Suippes, Marne, France" . On February 13, 1918 the group took part in an artillery engagement and on the morning of Feb. 14, 1918 left garage and arrived at Camp in Haussimont in the evening of the same date. Headquarters of the regiment, Batteries A, B, C, and Medical Detachment stationed at Haussimont, Marne, France, throughout the month. Intensive drilling in Infantry, Artillery, Gas Mask and Respirator, and railroad construction work was engaged in. The 3rd Battalion proceeded from Haussimont, Marne, France to Rayaumeix (Meurthe et Moselle) by rail March 5th, and arrived in vicinity of Rayaumeix on March 6, 1918. Mission: Construction of Epis. The 3rd Battalion (less Btrys "L" and "M") proceeded by rail from Rayaumeix on March 27, 1918 to Haussimont, Marne, France and arrived in Camp on March 28, 1918, and at the end of the month were still awaiting orders. Batteries "L" and "M" continued railroad construction work near Rayaumeix. The 2nd Battalion left Haussimont and proceeded by rail to Brienne le Chateau (Aube) on March 17, 1918 and arrived on March 18, 1918. Their Mission was to build Ammunition Dumps. Detachment of 1st Bn. (btry "D") proceeded from Haussimont to Somme dieue (Muese) on March 29, 1918 to engage in active operations against the enemy. Headquarters Company of the Regiment, Batteries, A, B, C, and Medical Detachment stationed at Haussimont, Marne, France and Hqtrs and Supply Co. stationed at Camp Le Mailly, Aube, France, throughout the month. The usual camp duties were performed by the batteries present, being intensively drilled in Infantry, Artillery, Signal, First Aid, Gas Mask and Respirator Drills and construction of gun emplacements. Railroad construction work was engaged in also. Battery "D" continued preparations for emplacements of 340 mm gun and B.C, station near Somme dieue (Muese) under directions of Commanding General, 2nd French Army. One round was fired on April 12, 1918. The troops were moved from Billets to Bivouac. The Camp was shelled by the enemy on the night of April 27, 1918 and the 28th in which the following named men were slightly wounded: Sgt. Walter A. Koenig, Mech. George Davis, Pvts. 1st Cl. Joseph A. Cryon, Ernest E. Dekle. Camp was moved April 28, 1918. Batteries E and G were detached from the Regiment and designated as the 7th and 8th Batteries, respectively of the Howitzer Regiment 30th (Separate) Artillery Brigade, CAC, Railway, per R.G.O.S., 29 April 1918. The 2nd Battalion left Brienne le Chateau (Aube) April 7, 1918 for Haussimont, Marne, France and arrived about 10 P.M. same date. On April 15, 1918, P.M. the 2nd Battalion left Haussimont to engage in active operations against the enemy, and arrived at Somme Suippe, Marne, France, April 16, 1918. From that date to the end of the month the Batteries were engaged in the preparations for firing, construction of dugouts and camouflaging positions. The armament consists of 4 - 19-cm Guns on Railroad mount. The 3rd Battalion, less Batteries "L" and "M", left Camp at Haussimont, Marne, enroute to Garage on the Champagne Front, April 7, 1918 and arrived April 8, 1918 in the vicinity of Somme Taurbe, Marne. From date of arrival to end of the month, the Battalion was engaged in construction of epis and general preparations for firing. There were no casualties up to the end of the month. The armament consisted of two 32 cm Guns on Railroad mount. Batteries "L" and "M" left St. Charles Farm April 8, 1918 and marched 6 kilometers and went into billets at Camp la Rebaune, near Rayaumeix (Meurthe et Moselle). The month was devoted to railroad construction work in general. On April 14, 1918, Private William H. Davis, Battery "M" was slightly wounded in the neck by a fragment of enemy shell, at edge of Bois de la Rebanne, on Minil la Tour, Bernecourt road, while engaged in railroad construction work during the shelling of that piece by the enemy. Usual camp duties were performed by Batteries "A", "B" and "C" stationed at Haussimont, Marne, France, during the month, including Infantry, Artillery, Signal, First Aid, Gas Mask and Respirator Drills. Proof firing was held by Battery "A" on the 5th and 31st of the month, with a 400 mm Howitzer. Battery "B" left Haussimont May 28th for Vatry, Marne, France, via motor truck for target practice with a 340 mm Rifle. Six rounds were fired on May 29th and the battery returned to Haussimont immediately after the firing. Battery "D" entrained at 700 P.M. at Somme diene, (Muese) and started for new gun position, May 11, 1918. The Battery was delayed at Chalons-sur-Marne one day on account of a "hot box" developing on gun truck. Battery immediately proceeded on its way to Verberie, Oise, France, arriving there May 13th and moved into billets on the 14th of May 1918. One gun detachment proceeded from Verberie to Ribecourt (Oise), and commenced work on gun position. Four rounds were fired on May 31st and no return fire was received from the enemy. The 2nd Battalion (Batteries "F" and "H") devoted month to improving campsite and sanitary conditions. Both Batteries were in action on May 3, 1918 and again on May 30, 1918. Return fire was received from the enemy, but there were no casualties. Batteries "L" and "M" devoted entire month to railroad construction work in general. Usual camp duties were performed by Batteries "A" and "C" stationed at Haussimont, Marne, France throughout the month. General inspection was held by inspector General on June 24th. Battery "B" left Haussimont June 14th, 1918 for Verberie, Oise, travelling via Grienne-le Chateau, Troyes, Fontainblau, Melun, Les Bourge and arrived at Verberie about 8 P.M. June 3, 1918. An air Raid was in progress when train pulled into station, and a few bombs were dropped in Rail Road Yards. Battery left Verberie at 2 P.M. June 4th and arrived at Ribecourt at about 6 P.M. same date. Battery was then billeted, and work was commenced on Gun Positions on June 5th. On June 6th, Battery "D" fired 15 rounds (340mm) on station and Railroad yards at Ham, from their position at Ribecourt. Enemy returned fire, during which five men of Battery "D" were slightly wounded and sent to hospital. On Midnight of June 8th and 9th, the enemy began heavy bombardment of positions of Batteries "B" and "D", with high explosive and gas shells. Nine men of Battery "D" were slightly gassed and sent to hospitals. The gun of Battery "D" was in position at time bombardment commenced, but a detail was at work, and the gun was removed from the position during the intermittent shelling thereof. During the day, June 9th the bombardment ceased and Battery "D" replaced gun in position and prepared to fire again. While the gun detachments were awaiting orders to fire, orders were received to evacuate positions immediately. Batteries marched out of Ribecourt leaving about 6:30 P.M. marching via Compiegne. Batteries arrived at Jaux and went into bivouac at about 11:30 P.M. Batteries left Jaux at 1:30 P.M. June 10th and marched to Verberie, arriving at about 3:00 P.M. same date, and went into billets, awaiting orders. At 5 P.M. June 12th orders were received and the Batteries left Verberie about 7 P.M. and proceeded to Etoury arriving at about 9:30 P.M. same date where a detachment of Battery "B" with 340 mm gun of that Battery was met. Batteries went into camp in woods and train. Batteries left Etoury at 9 P.M. June 13th and arrived at Haussimont, Marne about 4 P.M. June 14th. Battery "F" left Somme Suippes on June 20th and proceeded to Dommartin, a distance of 13 miles. Month was devoted to improving sanitary conditions and dugouts. Battery "H" stationed at Somme Suippes during the month fired 320 rounds in an Artillery Engagement on June 7, 1918. Headquarters of Regiment and a detachment consisting of 2 Officers and 25 enlisted men proceeded from Haussimont, Marne, France to Auve, Marne, France via motor truck on July 11, 1918. Headquarters and Supply Co., of the regiment moved from Mailly, Aube, France, on July 24, 1918 and joined Regimental Headquarters at Auve. Usual duties were performed by Batteries A, B, and C during the month including Infantry, Artillery, Gas Mask and Respirator drills. On July 24th a 340 mm gun was assigned to Battery "B", and preparations were begun to leave for the front. The 340 mm originally assigned to Battery "B" was turned over to Battery "D", the gun of Battery "D" having been sent to French Arsenal for repairs. Battery "D" entrained at Haussimont July 3, 1918 and proceeded to Dieulouard, Meurthe-et-Moselle arriving on July 4th. The Battery immediately moved into billets and gun was placed in position. Battery "F" left Dommartin sur Hans for position 166-A.L.G.P. at 10:30 P.M. July 14, 1918. Upon reaching this position, the guns were immediately placed in position and manned. Battery opened fire, which continued until 11:00 A.M. July 15, 1918. Battery again went into action from 6:00 P.M. July 17, to 9 A.m. July 18th and from 8:30 A.M. to 11:30 A.M. July 22, 1918. Fire was returned by German long-range 24's but the Battery suffered no casualties. From 5:30 P.M. to 9:30 P.M. June 30, 1918 the Battery was in action again. Battery "H", stationed at Camp Nantivet, (Somme Suippes) fired as follows: July 7th, 194 rounds, July 9th, 120 rounds, July 14th, 194 rounds, July 15, 452 rounds, July 19, 50 rounds. On July 15th the gun position and immediate surroundings were heavily bombarded by the enemy, during which 12 men were wounded. Batteries "I" and "K" left positions near St. Remy-sur-Busy on July 4th for new positions at Vaudemange. Battalion went into action on July 15th and 14 rounds were fired. The Batteries were under fire for 14 hours on July 15th, but there were no casualties. On July 17th 30 rounds were fired and 59 on July 18th. On July 18th, immediately after firing the Batteries left Vaudemange for new positions at Dommartin-la-Planchette. 52 rounds were fired from this position on July 24th, 64 on July 25th and 57 on July 31st. Results of firing during the month were very successful. Batteries "L" and "M" left Avroinville, Royaumeix for Haussimont, arriving on July 9th. Batteries A, B, and C, L, and M participated in French Independence Day Parade on July 14th in Troyes, Aube, France and also in a practice march of 31 kilometers on July 19th, making a tour of the surrounding villages. Usual Camp duties including the various drills were performed during the remainder of the month. Regiment was reorganized under G.O. 12, Headquarters Railway Artillery Reserve, dated August 4, 1918. Organization effective at midnight August 6th and 7th, 1918. Batteries F and H 53rd Artillery (CAC) transferred and became Batteries F and E, respectively 42nd Artillery (CAC) and Batteries I and K, 53rd Artillery (CAC) transferred and became Batteries E and F, respectively 52nd (CAC), per General Order 12, Headquarters Railway Artillery Reserve, dated August 4, 1918. Designation of Batteries L and M, 53rd Artillery (CAC) changed Batteries "E" and "F" respectively, 53rd Artillery (CAC) per G.O. 116, G.H.Q., American Expeditionary Forces, France dated July 15, 1918. Designation changed effective midnight of August 6-7, 1918. Headquarters of Regiment moved from Auve, Marne, France to Haussimont, Marne, France in accordance with G.O. 12, Hdqtrs. Ry. Art'y Reserve, 4 August, 1918. Organization of Regimental and Battalion Headquarters formally effected by Regimental General Orders No. 13, dated August 22, 1918. Personnel section of Regiment organized under G.O. 20, Headquarters Railway Artillery Reserve, dated December 20, consisting of one officer, (Personnel Adjutant) and three enlisted men (Personnel Clerks), proceeded from Haussimont, Marne, France to Mailly, Aube, France (Camp #1 R.A.R.) and took station at that place pursuant to instructions contained in G.O. 20, Hdqtrs. Railway Artillery Reserve, dated 20 August 1918. Usual camp duties were performed by Batteries "A", "B", "C", "E" and "F" stationed at Haussimont, Marne, France throughout the month, including intensive drilling in Artillery, Infantry, Gas Mask and Respirator, and First Aid. Battery "D" is position at Dieulouard, Meurthe-et-Moselle, did no firing, but were standing by waiting orders to fire. Regimental Headquarters entrained under orders to proceed to new station. Left Somme Sous, Marne station at 1:00 P.M. 3 September, 1918 and proceeded to Damevre, Meurthe-et-Moselle, France, via Vitry La Francois, St. Dizier, Jounville, Gandrecourt, Toul and arrived at Damevre without incident at 10:00 A.M. September 5, 1918. Troops were billeted in town and performed the usual duties of a Regimental Headquarters. Battery "C" entrained at Haussimont, Marne, France at 4:15 P.M. September 5, 1918 and left Somme Sous station at 10:00 P.M. same date arriving at Loxeville at 6:00 A.M. September 6, 1918. Guns (400 mm) were parked at Loxeville and camouflage set up and Battery fired 29 rounds on Fort leamp des Romains, in the offensive of the 1st Army of St. Mihiel. Battery returned to Haussimont at 10:20 A.M. September 20, 1918. Remainder of month was devoted to Infantry and Artillery drills and lectures. Battery "B" entrained at Haussimont, Marne, France September 3, 1918 and proceeded to Somme diene (Meuse) arriving at 7:30 P.M. September 4th. Work was immediately started on gun position and dugouts. On September 12th the Battery commenced at 2:15 A.M. on the Railroad Yards at Canflans. 36 rounds were fired on September 12th; 31 rounds on September 13; 19 on September 14th and 15 on September 15th with aeroplane observation. On September 16th the Battery moved to new position at St. Mihiel arriving at about 2 A.M. September 19th. Work on gun position was started immediately on September 24th, the position was very heavily shelled by the enemy, but there were no casualties. On September 28th the Battery was ordered to Ancecourt, moving by truck and arriving at 11:00 P.M. same date. Battery "D" stationed at Dieulouard, Meurthe et Moselle, awaiting orders to fire. On September 12th, Battery fired 2 rounds on bridge at Metz. On September 13th, 8 rounds were fired on this bridge and two rounds on Fort Prinz Von Wurtonburg. On September 14th, 9 rounds were fired on Fort Prinz Von Wurtonburg and four rounds on the bridge at Metz. On September 15th, 16 rounds were fired on the bridge at Metz. Battery entrained at 10:00 A.M. on September 19th at Dieulouard for Nixeville, arriving at 10:30 P.M. September 20th. Work of putting in the gun position was started. On September 26th, Battery fired 10 rounds on Railroad Station at Dun-sur-Meuse and four rounds on the village of Dun-sur-Meuse with no observation. On September 27th, 18 rounds were fired on the railroad station and 10 rounds on September 28th. The 3rd Battalion (Btry's "E" and "F" with Bn. Hdqtrs.) left Haussimont, Marne, France at 2:00 A.M. September 5th, 1918 and proceeded to Dieulouard, Meurthe et Moselle with 19-G (Platform) Guns arriving at 3:00 P.M. same date. Battalion left Dieulouard at 9:00 P.M. September 6th and arrived at Blenad, Meurthe et Moselle, at 2:00 A.M. on September 7, 1918. Battalion detrained in old Cement Factory, which was then under heavy shellfire. Preparations were immediately begun for the building of the gun positions and unloading ammunition. Battalion took part in the drive on the St Mihiel Salient by the 1st Army, firing on September 13th and 14th on enemy positions and reserve troops. On September 15th, 16th and 17th, the guns and material were removed from positions. On September 18th at 2:00 P.M. Battalion left Blenad and marched, full pack, 5 kilometers to Dieulouard, Meurthe-et-Moselle, going into camp on the outskirts of the village. On September 20th Battalion broke camp and entrained, leaving Dieulouard same date and arriving in Nueville au Pont, (Marne) about 10:00 P.M. September 21st. Battalion detrained on September 22nd and hiked to billets in edge of Argonne Forrest, thence 5 kilometers to gun positions, near Vienne le Ville, (Marne), September 23rd and 24th were devoted to preparations of the gun positions and from the 25th to 27th of September, the Battalion fired on various enemy targets in the Argonne Forrest. Remainder of the month was devoted to moving funs and material from positions. Battery "B" stationed at Ancecourt (Meuse) performed routine duties and commenced work on removal of platform. Battery entrained at 10:00 A.M. on October 3rd at Dieue (Meuse) and arrived at Haussimont at 3:30 P.M. October 4th. Usual camp duties were performed from that date to October 14th when Battery received orders to entrain. Battery left Haussimont at 4:00 A.M. October 15th and arrived at garage at Somme dieue at 9:30 p.m. same date. Platform was installed on October 17th, gun detachment placed in battery and were awaiting order to fire. On October 23rd, one round was fired, but observer was unable to locate on account of poor visibility. The target was the railroad yards at Conflans. On October 29th two more shots were fired on same target but no observation was possible. On October 30th one round was fired. Firing was discontinued on account of jamming of hoisting lever of front pintle against recuperator on the 340-mm gun. No material damage was caused by the accident, so six rounds were fired for calibration of powder on October 31st 1918. Battery "D" fired 14 rounds on village of Dun sur Meuse on October 4, 1918, without observation and 20 rounds on the same target on October 8th, again without observation. On October 12th orders were received from Headquarters Railway Artillery Reserve to proceed to Sommedieue at Vadelincourt, orders were received to return to garage at Nixeville. This was done, arriving at 2:30 a.m. on October 13th. Left Nixeville at 2:00 p.m. October 13th and arrived at garage at Sommedieue at 3:00 a.m. October 14th, and awaited to fire. On October 26th one round was fired, on October 29th, 2 rounds, and 6 rounds on October 30th. 20 rounds were fired on November 1st. All shlots were fired on Railroad yards at Conflans, without observation. The 3rd Battalion devoted the time from the 1st to 24th of October to Gas Mask instruction, Infantry Drill, Machine Gun Instruction, Signal Drill and school of non-commissioned officers. On October 24th at noon, the Battery marched to Vienne la Ville a disgtance of four kilometers to board train. Left Vienne la Ville at 2:00 p.m. October 25th and arrived at Baleicourt (Meuse) at 4:00 p.m. on October 28th. Remained in garage for the remainder of the month. Headquarters of the Regiment stationed at Charney (Meuse) in dugouts, performed the usual duties. Date 13 Oct 1918 HOUR 6:00 a.m. ASSIGNED TO DUTY WITH (2) Groupment McMillan, R.A.R. TELEGRAPH ADDRESS (4) c/o Groupment McMillan, Hq R.A.R. REMARKS (OPERATIONS AND OTHER MATTERS OF INTEREST) Battery consisting of 4 officers and 161 enl. Men, 5 enl. Men, Det 1st Bn, 53 Arty, 1 officer and 3 enl. Men Med Dept present at station. 1 officer and 21 enl. Men left a former station as guards. (1) TO BE SUBMITTED BY UNIT COMMANDER (BATTERY, BATTALION, REGIMENTAL) DIRECT TO HQ. ARMY ARTY, 1ST ARMY, A.P.O. #728 BY FIRST COURIER AFTGER ANY MOVEMENT OR CHANGE AFFECTING ANY OF ABOVE ITEMS (2) AMERICAN OR ALLIED UNIT UNDER WHICH SERVING (3) NAME OR NUMBER AND WHETHER AMERICAN, FRENCH, ETC., PERMAMENT OR MOBILE (4) LOCATION AND WHETHER AMERICAN OR FRENCH AND LOCATION OF REGULATING OFFICE, IF IN ADVANCE ZONE (5) LOCATION, WHETHER AMERICAN OR FRENCH AND FRENCH RELAY POINTS (6) FROM AND TO WHAT POINTS AND WITH WHAT ROUTES CONNECTED, WITH RELAY POINT. NEGATIVE REPORTS NOT REQUIRED. BRIGADE AND REGIMENTAL COMMANDERS MAY REQUIRE SUCH ADDITIONAL COPIES FOR THEIR RECORDS AS THEY DEEM NECESSARY. Date 22 Oct 18 HOUR 6:00 a.m.
POST OFFICE (3) c/o Groupment McMillan R.A.R. TELEGRAPH ADDRESS (4) c/o Groupment McMillan, R.A.R. On November 8th, battery "B" fired 5 rounds on railroad yards at Conflans, between 9:30 p.m. and 11:30 p.m. Battery "D" removed platform from position and made up train in compliance with telephonic orders from Granping McMillan. Battalion awaiting further orders in regard to change of position. The enemy shelled the position of the 2nd Battalion on November 9th but there were no casualties. Battery "D" moved to new position and battery "B" left garage at Genicourt. The 3rd battalion working on railroad near Chattancourt and on 14-inch Navy gun position near Gunneres. The 3rd battalion received orders from P. C. Diuyer to move back to train at Artelles. Movement was completed same date. Roads were very bad. On November 10th the enemy continued the heavy shelling of the position of battery "B", but there were no casualties. The following has been received from Colonel Spargis, Army Artillery at 9:18. Under instructions from Marshal Foch, transmitted by Commander in Chief, you are informed that hostilities will cease along the whole front beginning at a date and hour not yet determined (Paris time) and concerning which you will be notified later. Allied troops will not pass the line reached at that hour on that date until they receive further orders. Corps Commanders will report by telegraph to these Headquarters exact front line held by their troops at the hour and date of the termination of hostilities which is to be communicated to them. Special care will be taken to locate line securately. All communications with the enemy are forbidden both before and after the termination of hostilities. The fact must be emphasized that the prosed arrangement is an Armstice and not a peace, and that there must be no relaxation of vigilence on the part of all concerned. Troops must be prepared at any time for other operations. Special steps will be taken by all commanders to insure the strictest discipline and the early preparedness for any eventuality. All troops will be held in hand and higher commanders will personnaly inspect all organizations with the forgoing in view. By Command of Lieutenant General Liggett. The official hour is 11:00 a.m. The date is November 11, 1918. Note: This does not effect any construction work now going on. News of the signing of the Armstice receivedby all organizations and hostilities suspended. Two 14-inch Navy gun batteries stationed near Regimental Headquarters timed the last shot, so as to fall in enemy country at the exact hour. Ammunition on hand was turned in to the ammunition dumps, guns were cleaned, platforms removed and work of returning to camp was started. Regimental Headquarters - November 20, 1918. 1st battalion (Battalion headquarters and battery "A") - November 23, 1918. Battery "C" - stationed during the month. Batteries "B" and "D" and 2nd battalion Headquarters - November 24, 1918. Batteries "E" and "F" and 3rd battalion headquarters - November 26, 1918. Entire regiment immediately began preparations for embarkation to the United States. Regiment proceeded from Haussimont, Marne, France on December 6, 1918 pursuant to instructions contained in Special Orders No. 195, Headquarters Railway Artiullery Reserve dated 5 December 1918 to Base Section, No. 1 (St. Nazaire, Loire Inferieur) for embarkation to the United States. At Nazaire, Loire Inferieur, telegram was received from Commanding Officer, Base Section No. 1 to detrain at that place (Nantes). Regiment detrained and proceeded by marching to Les Lauets where 2nd and 3rd battalions with battalion headquarters were billeted in an old seminary. Regimental headquarters with 1st battalion and battalion headquarters proceeded to Bouguenais, where troops were billeted. Regimental headquarters established office in Chateau and ususal duties were performed. Regiment participated in hikes and drills during the morning and afternoon periods of the day, weather permitting. Private First Class Charles M. Grendstaff, 151885, and Private Frederick M. Murphy, 151936 of battery "D" 53rd Artillery (CAC) were awarded the "Croix de Guerre" on December 20, 1918 for bravery in action on June 6, 1918 at Ribecourt, aise, France. In accordance with S.O. No. 198, para. No 12, from Hdqrs. Railway Artillery Reserve dated 2 December the organization shown above, consisting of 58 officers and 1584 men left Haussimont for Loire Inferiure on 6 December arriving about 1 a.m. 8 December and reporting to Commanding Officer, U.S. Troops, Nantes. Daily Report of Casualties and Changes, Form 647-648 last submitted at this station, 5 December 1918. Weekly Strength Return last submitted at this station, 4 December 1918. Will submit reports continuing from dates shown above to Statistical Officer new station. To be submitted on change of station of any organization or detachment. In compliance with the provisions of Section 5, par. 3, (B), Embarkation Instructions No. 13, Headquarters Services of Supply, American Expeditionary Forces, France dated January 4, 1919, the regiment was formed into Provisonal Detachments of Coast Artillery and Medical Department, unassigned without loss of rank or grade, under authority contained in paragraph 5, cablegram-A-2246. The regiment proper, going to Camp Sherman, Ohio. Pursuant in instructions contained in paragraph 5, Special Orders #43, Headquarters, U.S. Troops, Nantes, dated February 12, 1919 the regiment proceeded from Bouguenais and Les Canets, Loire, Inferieur, France by marching to Nantes on February 14th to entrain for St. Nazaire, France. Regiment left Nantes at 10:50 a.m. February 14 and arrived at Embarkation Camp No. 2, St. Nazaire at 2:30 p.m. same date. Regiment was billeted and continued preparations for embarkation. On February 20th the regiment proceeded from Camp No. 2 to Camp No. 1, and was put through the "Delousing" plant in accordance with Embarkation instructions. On February 23rd the regiment returned to Camp No. 2 for final physical examination, prior to embarkation. Pursuant to instructionscontained in paragraph 5, Special Orders #54, Headquarters, S.O.S. Embarkation Camp, Base Section, No. 1, St. Nazaire, France, 23 February 1919, the 53rd Artillery (CAC), consisting of approximately 26 officers and 1491 enlisted men proceed to board the U.S.S. "Nansemond", for the United States. The regiment boarded the ship at 11:30 a.m. February 24th, regimental headquarters being the first to board of the 53rd Artillery (CACF), all organizations were aboard by 6:00 p.m. same date. The ship left dock at about 9:30 a.m. February 25 and started on its ourney to the United States. The following organizations were on board the U.S.S. "Nansemond", in addition to the 53rd Artillery (CAC), 74th Engineers, 56 Engineers, 55th Ammunition Train, Cement Mills Co. #3, Casual Companies (St. Nazaire) Nos. 68, 69, 70, consisting of convalescents Casual Cos. Nos. 151, 160, 161, 162, 163, 166, 170, and 174, and St. Aignon Casual Company No. 466. The total number on board was 136 officers and 5325 enlisted men in addition to the ships crew and 3 Y.M.C.A. and one Red Cross Worker. The trip across proved uneventful except for one day, in which some bad weather was had, but through which the good ship "Nansemond" came out above the water. This ship was formerly the Hamburg-American freighter "Pennsylvania", and has the redord of carrying the largest cargo of freight at one time, that ever crossed the Atlantic. The ship arrived off the coast of Virginia sometime after dark on March 10th. On March 11th the ship reached the docks and Newport News, Virginia where a rousing welcome was given the returning troops. Regiment marched to Camp Stuart, Virginia where preparations for the demoblization of the regiment were begun. The troops were again put through adelousing plant. From 23 March 1919 to 31 December 1919 the regiment performed the usual camp duties. War Department Historical File, 1900-41, entry 310, box 328, Records of the War Department General Staff, Record Group 165; Records of the 53rd Coast Artillery Corps, American Expeditionary Forces, Historical Section 132-11.4; Declassified 3 July 1948; National Archives at College Park, College Park, MD. The Regimental Crest of the 53rd Artillery, C.A.C. 2. 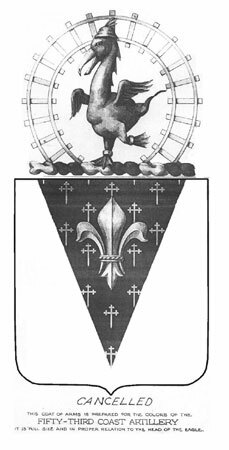 This design, which is the combined effort of all the genius contained at the present time in the Railway Artillery Reserve, is intended to represent as well as can be recalled by memory, the Oozlefinch, a rare bird which you will recall was incarcerated in a cage in one of the card rooms at the Fort Monroe Club. 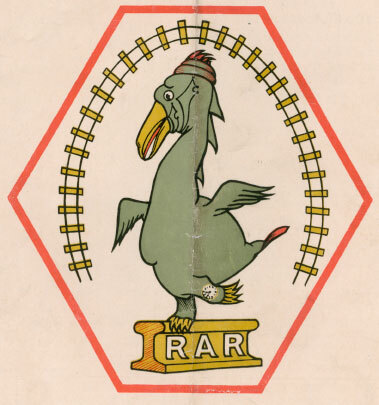 You will recall that this bird is a "sui generis", and believed to be the only one in captivity, hence; after much reflection, I have concluded to adopt it as the emblem of the Railway Artillery Reserve, A. E. F., being symbolic of the only Railway Artillery Reserve known to exist in our service. You will note from examination of the accompanying drawing, that the Oozlefinch, while not stenciled, is very proud of itself. He wears a trench helmet, perhaps uselessly, but with effect. He has not many feathers, but in order to give a coquettish appearance, he has his left foot cocked up in the air. On this foot you will notice a wrist watch, which indicates 7:30. This indicates the hour for all hands in the Railway Artillery Reserve to begin work. On his right leg, he wears a plaque d'identite, which all chic soldiers are now supposed to wear in France. You will further notice that he is perched upon a section of the rail, symbolic of the Railway Artillery Reserve, being surrounded by an epi which permits him to fire in any direction. The design is placed upon a white polygon, surrounded by red, suggestive of the Coast Artillery Corps, and having many sides, is supposed to be an allusion to the capabilities of the Coast Artillery Corps officers, who, in France, perform any duty but that pertaining to the Artillery Corps. 3. The motto of this design is "Abandonné en France, sans mi," which you will readily interpret, "Abandoned in France "without Friends." The first Sing for several months on United States soil was enjoyed by members of the 55th ammunition train, the 74th engineers, and the 53rd coast artillery corps in Margaret Wilson hut in Camp Stuart Tuesday night. They threw themselves into the songs with zeal. Approximately fifteen hundred officers and men composing the 53rd coast artillery, which arrived here several days ago from France, will be shipped to Camp Eustis in detachments of 500 men each March 15, 16, and 17, it was announced at transportation headquarters yesterday. It is thought that these men will be demobilized in the big artillery camp. A train from Camp Stuart today to Camp Dix, New York, will carry a thousand members of the 335th and 336 field artillery and 71 casuals for demobilization. The train will leave in two sections, one of 11 and one of 10 coaches, at 9 a.m. At 11:30 a.m. another train of 10 coaches will carry 300 members of these two to Camp Devens, Massachusetts. Another train, leaving Camp Hill at 9:30, will have onboard the following demobilization centers. Camp Shelby, 45 casuals; Camp Pike, Arkansas, 131; Camp Bowie, Texas, 153; Fort Oglethorpe, Georgia, 27. One coach will go to Camp Meade with detachments consisting of 52 men, and a casual group of 15 men.